PTF e.V. has just released it’s 2014 Annual Report covering the organization’s inaugural year. Despite its relatively short existence, PTF e.V. has managed to establish its presence, build an impressive membership and develop program proposals. Due to these diligent efforts, PTF e.V., in partnership with PASOS, won its first EU tender for “Partners in Empowerment,” a €1 million sub-granting and capacity-building program that will begin operation in 2015. 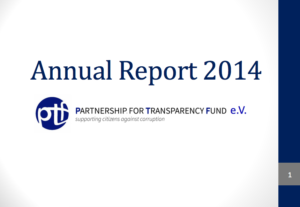 Download PTF e.V.’s 2014 Annual Report to read more.